Odilon Redon: Day appears at last . . .
Day appears at last—and, like tabernacle curtains uplifted, clouds of gold uprolling in broad volutes unveil the sky. In the midst thereof, in the very disk of the sun, shines the face of Jesus Christ. Anthony makes the sign of the cross, and resumes his devotions. These words conclude Gustave Flaubert’s 1874 novel/drama The Temptation of Saint Anthony, which describes the many phantoms that appear to the third-century desert monk over the course of one night, besieging him with carnal temptations and philosophical doubt. Anthony dialogues with the Sphinx and the Chimera and a host of other mythological beings, and staves off the allure of women, death and pantheism, and then at last the fogs dissipate and God grants him a vision that trumps all the others: Jesus Christ, exalted, haloed by the sun. Literary critics assailed the work as esoteric and unreadable (it was a radical departure from the realist novels for which Flaubert had earned his fame), but the French artist Odilon Redon was attracted to its mystical, haunting quality, calling it “a literary marvel and a mine for me.” He created three separate lithograph portfolios based on it. The third, the most ambitious, comprises twenty-four lithographs, published by the French art dealer Ambroise Vollard in 1896. In this final lithograph from the group, a mood of calm and clarity takes over—after a sequence of oppressive spiritual torments, levity; after the dark of doubt, the light of truth. Here is Christ, a Man of Sorrows, but one whom death could not hold. 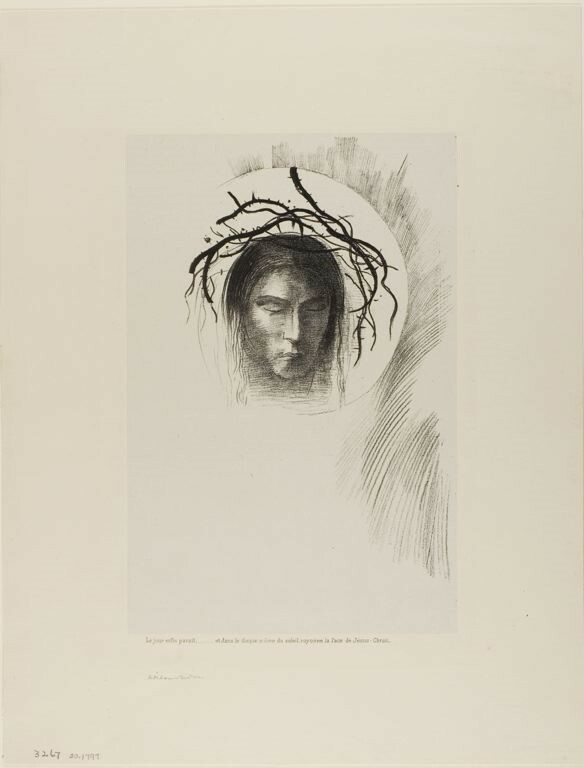 The thorns in Redon’s image do not weigh down on Christ. They don’t even touch him. Instead, his death repels them. As he bows his head, the mock crown disentangles and levitates, suggesting a resurrection in progress—death, the curse, disassembled, undone. And Christ is crowned with the sun, with glory. This resurrection signals a victory for Anthony. As he beholds the visage of his savior, who freed himself from Satan’s grasp, Anthony rises up out of his own nightmare and, thus empowered, continues on his faith journey. The phantoms might return, but Christ’s truth is more powerful than theirs, his promises more sure. Redon’s lithographs appealed to the literary coterie, who became one of his primary bases of support. Although the images were often inspired by texts, Redon never thought of himself as an illustrator in the traditional sense, declaring, “I have never used the defective word ‘illustration.’ You will not find it in my catalogues. The right term has not yet been coined. I can only think of transmission, of interpretation.” The correspondences to literary source material in his lithographs, therefore, are always loose. Redon wanted his work to be ambiguous and broadly allusive rather than literal or direct. Odilon Redon: Day appears at last . . . and in the very disk of the sun shines face of Jesus Christ (detail), 1896. Lithograph on chine appliqué, from Redon’s third Temptation of Saint Anthony portfolio, published by Ambroise Vollard, Paris. Edition of 50. Composition (irreg. ): 10 1/2 × 6 3/8" (26.7 × 16.2 cm); sheet: 20 1/2 × 15 13/16" (52.1 × 40.1 cm). Odilon Redon (1840–1916) was a French painter, printmaker, and draftsman who belonged to the Symbolist movement, which emphasized the spiritual reality that underlies the physical world. Inspired by darkly Romantic or visionary texts by authors such as Baudelaire and Poe, Redon first became recognized for his “noirs,” the enigmatic and often macabre charcoals and graphic albums he executed in shades of black. Later in his career, he worked with vivid pastels, oil paints and watercolor pigments to create images of serenity, many of which were influenced by the Catholic revival in France. 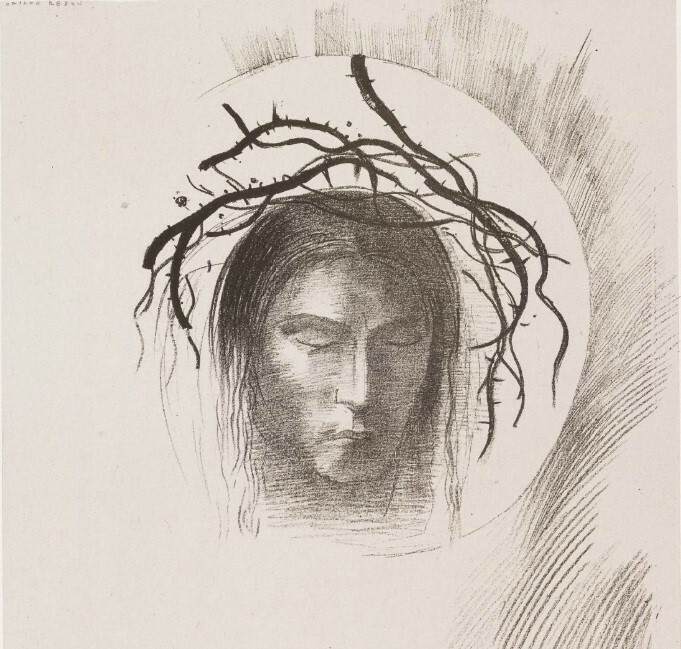 To view more of Redon’s works on the subject of Christ Crowned with Thorns, click here.